16.54 in. x 11.03 in. x 4.73 in./14.96 in./19.69 in. Enjoy a Bar-B-Q feast wherever you'd like with Picnic & Beyond's unique basket. Includes service for two, including flatware, plates, wine glasses and salt - pepper shakers. You'll also receive a cooler bag, opener and napkins. Insulated food compartment. Wood - wicker frame. 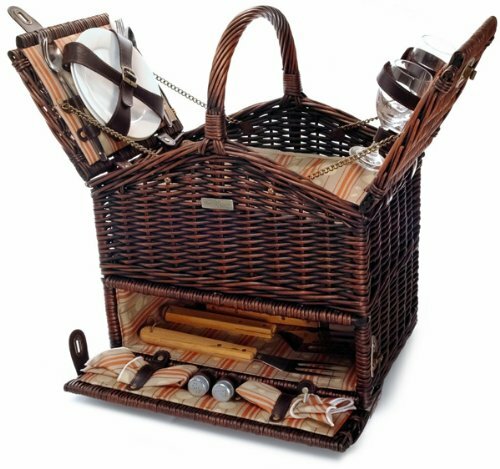 * Picnic Basket with three BBQ tools and service for two with large insulated food compartment. Content: 2 sets of s/s flatware, 1 set of BBQ tool, 2 ceramic plates, 2 wine glasses, 1 opener, 2 salt and pepper shaker, 1 cooler bag, 2 napkins. 16.54 in. x 11.03 in. x 4.73 in./14.96 in./19.69 in.. Weight: 9.08 lbs.